Where should I sell my soybeans? Should I sell my soybeans or grain to the local elevator or the more distant market offering a premium price? At what point is it no longer worth selling to the more distant location? After all, selling at the higher price is not always the most profitable option. Farmers must not only be mindful of the price received, but also the costs associated with transporting their soybeans, or other commodities, to market. In a few quick steps, the below calculator assists farmers in measuring not only how much money will be received, but also how much will be spent. 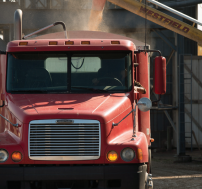 What is the total bushel capacity of the semi or truck used for transporting your soybeans or other commodity? Whether you hire someone to deliver your soybeans/grain or deliver them yourself, time is money. Insert the hourly wage you pay to deliver your soybeans or the value of your time per hour (should at least be comparable to the prevailing hourly wage). Diesel price per gallon divided by mileage efficiency per gallon of the delivery vehicle. For amounts less than $1.00, initially enter a decimal point (e.g., 0.60). Suggested amount: $0.50 per mile. For amounts less than $1.00, initially enter a decimal (e.g., 0.50). Hire someone else? Click here to enter the commercial rate per mile you pay. Do it yourself? Click here to enter the cost of labor, fuel, and maintenane you pay. Mileage to delivery point Note: Calculator will automatically double the mileage to account for the return trip to your farm. Note: Calculator will automatically double the mileage to account for the return trip to your farm.